The boat dock is availableat Level 17 and must be repaired for 16,000 coins. 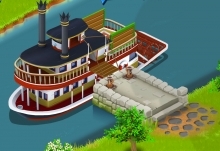 Once repaired, boats will begin to stop at the dock and allow players to fill orders. Boat orders remain at the dock for 17 hours and once an order is completed the a player can choose to send the shipment out. If the dock is empty, the player can click on the dock to view the arrival of the next boat.